The Media: I said that!?! The way you keep and raise your dogs affects their gait. A few eyebrows must be going up. Over the years, I have seen and kept a great many dogs. Let's start with my own dogs and the way I raise and keep them. Throughout their lives, they run loose several times a week, then return to large pens where they have room to run. When I had four ISD and we all lived in the city, these four never ran loose, but three times a week in winter and everyday in snow less season, each dog and I ran some three miles with leash and collar. It was alot of work and efforts, but it was worth it. They maintained the fluid, long gait which you can observe in running wolves. Elegant and effortless. Obstacles were jumped with ease and room to spare. I have rescued and acquired adult dogs who had been picketed since puppyhood, and only run on the sled or cart. When those dogs arrived inToadhall and were set loose, they soon understood they were free to run and loved it, until they came to a fallen tree across the trail. They didn't know what to do. They stopped and looked at me. My own dogs jumped over. The other watched, looked at the tree and attempted to go around. I thought there was hope for them since they were showing intelligence in assessing the situation and solving the problem. After a few weeks, they were jumping over obstacles, rather clumsily. It took them several months before they acquired ease and poise when confronted by an obstacle. But they had a choppy gait and never acquired the fluidity my own dogs display in their running. Other dogs came to me who had been raised in standard pens. When these were set loose, they ran better than the picketed dogs, and it only took them one outing to understand that trees across the trail are to be jumped over. But their gait was choppy too. Less than the picketed dogs, but not as fluid as the Toadhall dogs. It was soon apparent that these differences in gait would not work out very well in harness. It didn't. My ISDs were faster - not by much, but enough to stress the others. So they sledded separately, each their own gait. All good workers and good pullers. There was no difference there. Rooroo is the latest adult to have joined the Toadhall gang. She lives with Frison, a Toadhall male, and she is the one who inspired me to write this item. At first, she didn't want to run loose, now she loves it and her gait is getting freer, but she is consistently behind Frison. She just can't keep up with his speed. Yet, all my females are by far faster than the males. These two are not sledding this year. Frison is consolidating his recovery from an injury to a toe pad. We can only assume the pad was sheared off, hanging by just a few milliliter of skin, on a piece of metal. The vet sewed it up, but expected to amputate the toe as the pad had separated from the bone. To everyone's amazement, the pad stayed on, and obviously regrew nerves and blood vessels. 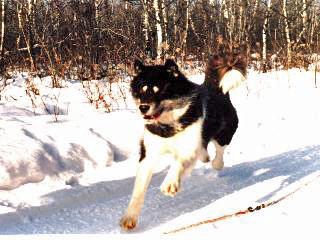 Is this not a proof of the robust health of the Inuit sled dogs?